* During WINTER we will be offering only FIRST CLASS accommodation and specially reduced prices will apply! DAY ONE: Depart from Athens via the Corinth Canal, where we will make a short stop for pictures. 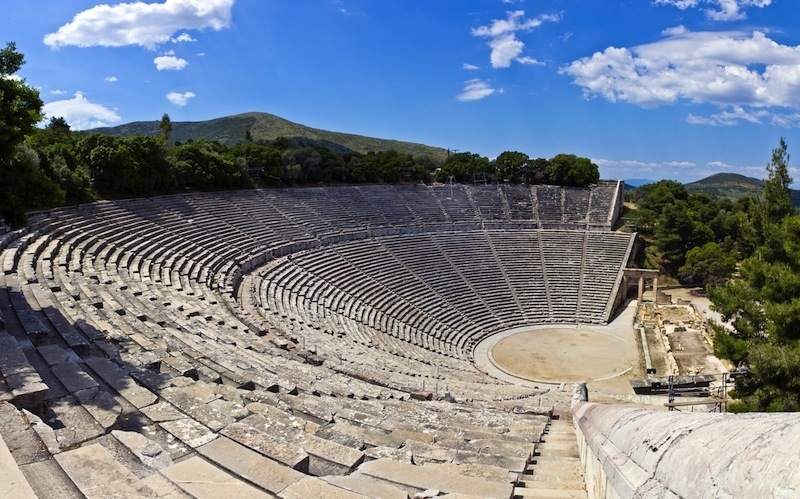 Upon arrival in Epidavros, we will visit the Ancient Theatre of Epidavros, which is world famous for its acoustics and where the plays of famous Ancient Greek playwrights, such as Sophocles and Euripides, were first staged. We then proceed on to the the beautiful coastal city of Nafplio which was also the first capital of Greece, where we will briefly stop for refreshments and pictures; and then on, through the fertile orchards of Argos, we finally arrive to the archaeological site of Mycenae, where a guided tour will take place, including the Tomb of Agamemnon. We then continue our journey for Ancient Olympia, birthplace of the Olympic Games and an area of exceptional natural beauty, passing through the cities of Tripolis and Megalopolis, where there will be a short stop for refreshment. Overnight stay in Olympia. DAY TWO: After breakfast we begin our second day by touring the very interesting Archaeological site of Olympia. We will see the Temple of Zeus, the Temple of Hera, the spot where the Olympic Flame is lit, the Ancient Stadium and the Archaeological Museum. Our next destination is the Sanctuary of Delphi where we will arrive passing through the cities of Patras, where we will make a short stop and Rion. After Rion we will cross the Corinthian Bay by the new and impressive Antirion bridge and then pass by the city of Nafpaktos before arriving in Delphi by the coastal road in the afternoon. Overnight stay in Delphi. DAY THREE: After breakfast we will enjoy a fascinating tour of the Ancient Sanctuary of Delphi, which was considered the “navel of the world” in ancient times and the impressive Delphi Museum. After lunch your tour will continue to Kalambaka, a town built at the foot of the majestic Meteora Monasteries, via the fertile valleys of Thessaly which are considered the grain basket of Greece. A brief refreshment is scheduled along the way. DAY FOUR: Morning departure for the World Heritage Site of Meteora and the post Byzantine Monasteries perched on top of the sandstone cliffs where visitors will be awarded a birds eye view of the fertile plains below. The monasteries or holy fortresses were inaccessible for years to the outside world and provided a secluded sanctuary for monks. Meteora is considered one of the most unique attractions and beautiful areas of mainland Greece. An optional visit to a Byzantine style icon factory will be on the program if you so wish to visit. On the return journey back to Athens you will pass by Thermopylae, the place where one of the most important battles of Greek antiquity took place in 480 BC and the monument of the heroic King of Sparta, Leonidas. A short photo stop is scheduled. Arrive in Athens by late afternoon. This is a HB tour. Lunch is not included, only breakfast and dinner are included. This tour starts at 08:30 and is operated between April and October every Monday, Tuesday and Saturday. Please note: During WINTER we will be offering only FIRST CLASS accommodation for this multi-day tour. All entrance tickets are included in the price! This tour starts at 08:30 and is operated every Monday, Tuesday and Saturday.